NASA astronaut Terry Virts took this image from the International Space Station in 2015 to honor Leonard Nimoy, who had recently died. The gesture is one of many astronaut connections to "Star Trek." Terry Virts was halfway through an International Space Station mission when the lifelong Trekkie received some sad news: Leonard Nimoy, who played the beloved Vulcan character Spock, had died at age 83. During a busy day on Feb. 28, 2015, Virts, an Expedition 42-43 spaceflyer, received an email with the news from a friend in NASA's astronaut office. Virts wanted to commemorate Nimoy's passing; with time on the space station often scheduled in 5-minute increments, however, he had only moments to reflect. 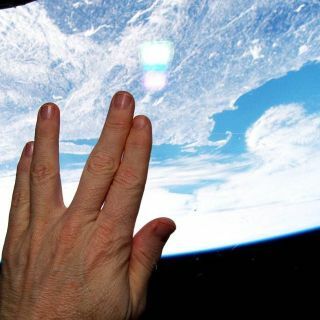 "The idea came to me: I'll do the Vulcan 'live long and prosper' sign with Earth in the background," Virts told Space.com in an interview. "So I ran and tweeted it in literally a few minutes. That was the only time I had." The Twitter post generated more than 38,000 retweets and was widely covered by worldwide media. Coincidentally, the picture was taken over Nimoy's birthplace of Boston. While this is one of the most famous examples of "Star Trek" influence reaching into orbit, astronauts and "Star Trek" have intersected in many ways over the past 50 years. When "Star Trek" first aired, on Sept. 8, 1966, the American human space program was only four years old. NASA was practicing rendezvous, docking and spacewalks in the agency's Gemini program. The Apollo moon landings were still three years away, and the space shuttle was only just being designed. It was an exciting time for future American astronauts, including Virts, Tom Jones and Mike Massimino. All three would become shuttle and space station astronauts, and they told Space.com that the 1960s space program highly inspired them as children. "Star Trek" was a lesser influence, they said. "I really liked the original series, but I don't think it was an inspiration," said Massimino, 54, who participated in two Hubble Space Telescope repair missions. He said he remembers sitting in kindergarten knowing he would watch the series with his older brother that night. He caught the show again in reruns, but he said his real inspiration came from Neil Armstrong — the first moonwalking astronaut — and "those guys" from the Apollo program. Tom Jones, 61, said he remembers watching the original series when he was about 11. At the time, he was already following the "space race" between the United States and the Soviet Union to the moon in newspapers and on television, he said. "When they brought out a new series like 'Star Trek,' it was an additional push toward space as a career possibility," Jones said, but he added that he caught the space bug from several sources. Still, he said he would run home from his Boy Scout meetings three blocks away to catch the opening moments of the show on Friday nights. Virts, 48, said he recently found a picture of himself from his elementary school years, wearing a yellow "Star Trek" shirt. He used to watch reruns of the show at his father's house and think of how cool it would be to have a communicator — just like the smartphone version he uses today, like for the Space.com interview, he joked. "Star Trek" continued as a constant through his early career, Virts said, adding that he remembers discussing Captain James T. Kirk's leadership style in classes at the U.S. Air Force Academy. The first "Star Trek" movie, in 1979, also resonated with Virts, he said, because it mentioned a real-life space mission called Voyager. While Virts was a fan of "Star Trek" and "Star Wars," he said he considered the series about "dreaming what was possible in a cool way that was more sparking the imagination." That's why he said the science-fiction series were only a partial influence, because he could see NASA doing real things as they proceeded through the Apollo, Skylab and early shuttle programs. Virts got a surprise invitation to be on the very last "Star Trek: Enterprise" episode in 2005 after being a mission backup for Mike Fincke, an Expedition 9 astronaut. Fincke, for his part, spoke with Scott Bakula (who played Captain Jonathan Archer on "Enterprise") during his time in space. After Fincke's flight, he and Virts were at NASA contractor meetings in Los Angeles when they were invited on the set of "Enterprise" and eventually given a short cameo. Their appearance put the astronauts in a select group of "Star Trek"-appearing spaceflyers; the first was Mae Jemison, who appeared on "Star Trek: The Next Generation" in 1993. Virts' "Star Trek" connection persisted for years afterward. In 2009, Virts recorded a special feature for a "Star Trek" DVD set. And recently, Virts sat at a table with the original series' George Takei (who played Hikaru Sulu) during a charity event led by Apollo 11 astronaut Buzz Aldrin. "I showed him the Spock Vulcan symbol [tweeted from space], and he told me some cool stories about Leonard Nimoy," Virts recalled. "It was surreal. [I thought], 'When I was little, I watched you in reruns, and now I'm having dinner with you.' Having been to space myself, I am having dinner with Mr. Sulu. It was really amazing." Massimino is now the senior advisor for space programs for the Intrepid Sea, Air & Space Museum, an attraction housed on an aircraft carrier in New York City. The museum is hosting the traveling "Trek"-themed exhibit "Star Trek: The Starfleet Academy Experience" on the adjacent pier. "Star Trek" has some potential to inspire kids, but it's not necessarily a way to educate them, Massimino said. He added that he is working to educate people in other ways — through his new book coming out Oct. 4, by teaching at Columbia University and also spending time at the Intrepid. "We were in the pioneering stages of space exploration, even in the shuttle era," Jones said. "We didn't expect to live life according to the 'Star Trek' model, but it was fun to see what parallels were there."